Takoyaki Stand in Kadogawa Town has been closed down. You can gamble on the horses in Kadogawa at a Keirin place. How does one process one's rice in Japan? Here's the Joyfull Restaurant near the road to Takachiho in Nobeoka. Let's study at Sazanpia, Nobeoka. There's an Okonomiyaki restaurant over there that I like very much. It's in Nobeoka. This used to be the "Anne's House" of Nobeoka. Do you know the one on Beach Blvd in Buena Park, CA? Here's the only Surfer's Shop in Nobeoka. This Nishi No Maru Pachinko Parlor in Nobeoka is still closed. And, yes, they even have a Colonel Sander's in Nobeoka. This is perhaps the bussiest Pachinko Parlor in Nobeoka City. Gasoline is going down in price. It's now 93 yen a liter. A liter is about a quart, I believe. Some of you old timers may remember the motorcycle hanging from that yard arm over there. I am still living easy in the city of Nobeoka, Japan. The old Chalon Restaurant has been turned into a "rotary sushi bar". At this Pachinko Parlor, the steel balls now cost 1 yen each. They used to cost 3 yen each. And, we do have a Mr. Donut here in Nobeoka. We are not barbarians, you know. In Nobeoka, we even have a Baskin Robin's - 31 Flavors ice cream parlor. Thanks Ed, I read that carefully. English and Japanese Readings on the Internet - Learn to speak English or Japanese For Free! The Ahner Garden in Tsurugaoka, Nobeoka. Keiko Ahner is preparing for another show in Miyazaki. February, 2008. How can you keep the birds from dropping on the art outside of your building? Howard Ahner loses the pounds in the hospital. Hikari Jidoukan Videos late 2007: Click on the pictures to see the videos. Here's Proof that I onced played wall-tennis in Kami Igata Cho, Nobeoka. I once walked on these tennis courts in Tohmi, Nobeoka. They belong to Asahi Kasei. Wow! I started working at Zaikouji Youchien in Hyuga in 1991. I hope these notes on Nobeoka and Japan don't offend anyone. This used to be where the Marusei Bookstore building was, but not anymore. Right On is a clothing chain store. I don't think it has much of a chance to stay open in Nobeoka. Howard in front of Max Value, Nobeoka. Hyuga City has pretty manholes. I went to the Nobeoka firework show on my Honda Cub. It was easy to find a parking space. How nice it would be to be a junior high school student once again. Keiko Ahner teaches English at Peare and Midorigaoka Elementary. I thought I might like to move to Urashiro, but my wife let me know that it was out of the question. I could be proud living in this house. Well, I picked them out of the Igai River, and I raised them from babies. I didn't draw these. I want to be clear about that. Some people might call me a lucky man. "Attention! You are now entering civilization. Put on your gas mask, please." The Fire Dept. Says, "No fires anywhere in Japan." But, it's really on a case by case basis. I hope we don't have a fire in the Kami Igata neighborhood. When are the economic conditions of Nobeoka going to improve? How would you like to have smoke roll into your bedroom every morning and evening? Have you seen "Stoneheng" in Kami Igata? These shoes are made for walking out of Nobeoka. There is confusion about what to do about the HIMA in Nobeoka. The tides will soon be changing in Nobeoka for the better. Howard Ahner Makes it Clear! We should face our flag. Click on my picture to see some lure fishing in Nobeoka. He's a friendly guy in Nobeoka. 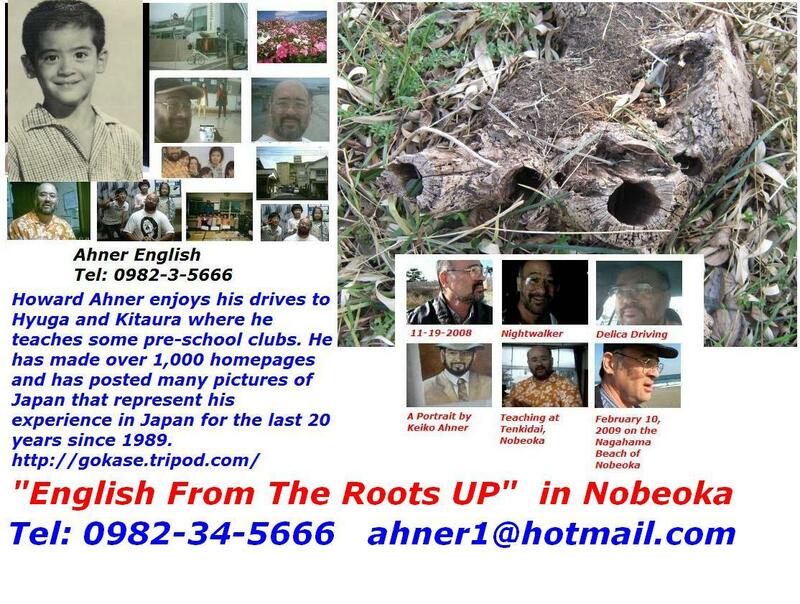 Howard Ahner moved away from the smoke and smells of Kami Igata Cho, Nobeoka. Ask the English teacher to check your English sentences for mistakes. Champion's Field, Nobeoka and Future Workers of Nobeoka, Let's Fight! A house that we rejected, but it's just around the corner of our new house in Tsurugaoka. It's time for another Joke. Just help other people get the good feelings they want. "The first key to writing is not to think. Write with your heart. Editing comes later." "The secret to a woman's heart is an unexpected gift at an unexpected time." There used to be a movie theatre across from the old Azumaya where Joyfull now exists in Nobeoka. Let's drive safely in Nobeoka, OK? We need to take better care of our earth. 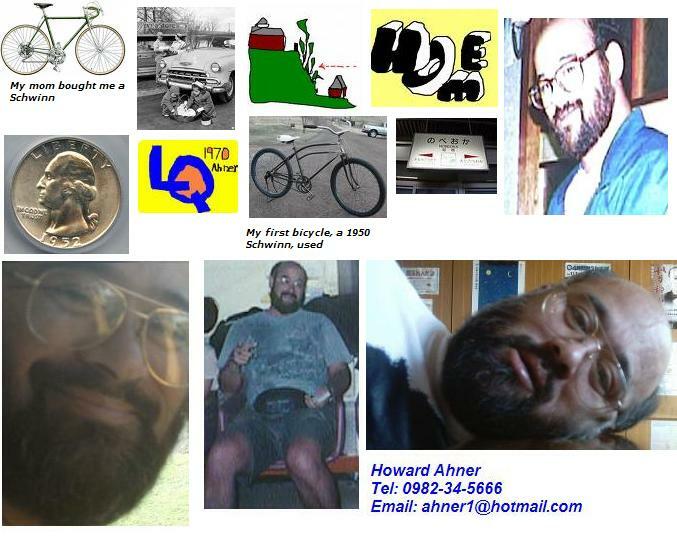 Howard Ahner couldn't eat or drink for over three months.